Featuring Flag Games & Football Instruction and Recreational Fun! 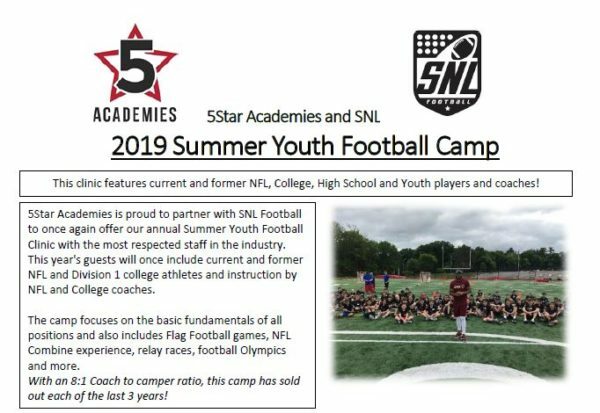 5Star Academies is proud to partner with SNL Football to once again offer our annual Summer Youth Football Camp with the most respected staff in the industry. This year’s guests will include current and former NFL and Division 1 college athletes and instruction by NFL and College coaches. The camp focuses on the basic fundamentals of all positions and also includes Flag Football games, NFL Combine experience, relay races, football Olympics and more. With an 8:1 Coach to camper ratio, this camp has sold out each of the last 3 years! This will be the ultimate youth football event for all ages and skill levels. This camp is open to all football players from beginners to advance level. Training groups will be separated by experience and age to maximize instruction and safety. Learn football, play flag games and more fun!